Only the (WAN) Port should have a default gateway configured. If other ports require a gateway, you will need to configure a static route. The WAN network interface port must connect to a network that supports external DNS resolution to ensure Cloud Connectivity. Click the Select External Trunks drop down and select any external trunks that you want to connect to the network interface. Check that Phone Trunks is set to Inherit from Edge Group. 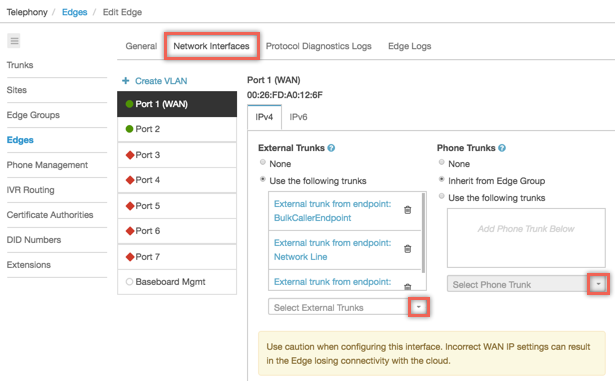 Note: Port 1 (WAN) inherits phone trunks from Edge groups by default. To manually add phone trunks to the Edge, click the Select Phone Trunk drop down and select any phone trunks that you want to connect to the network interface.